Home/Celebrating Our Allies/Thank You, Ruth Rogers! From keeping the office candy jar stocked to stewarding policies in the boardroom, Ruth Rogers has been an ally to Nature NB for over 40 years. She has been described as a true ‘workhorse’ of the organization by her colleagues, with a lifetime advocating for nature and conservation since she was ten years old. “Ruth is an all-around amazing person, I always go to her for ideas on policy. She loves nature immensely and is just an easy person to talk to,” said Vanessa Roy-McDougall, Executive Director at Nature NB. Even when Rogers was just ten years old, she pledged herself to conservation and the protection of our wildlife through an organization called the Kindness Club, a non-profit dedicated to the humane treatment of animals, started in 1959 by Aida Flemming of Fredericton. “I was the secretary, and we were applying Robert’s Rules of Order then. Our club was the Bunny Club! I still call one of my cousins who was part of the club, Bunny Debbie, and she still calls me Bunny Ruth. I remember one time my brothers and their friends were messing around with frogs, and we told them we were going to kick them out of the Kindness Club if they didn’t stop.” Rogers laughed. Rogers passion for policy-making carried into her career. She was a registered nurse and took a leadership role in revising policies and standards for the nurses association of New Brunswick, the regulatory body for registered nurses. From here, Rogers took the skills she learned from the Kindness Club, and as a registered nurse, and put them to work for the benefit of Nature NB. While Rogers no longer serves on the Nature NB board, her influence can still be felt, and the policies she strove to put into place are still around today. She is still a member of Nature NB’s policy committee and lends a helping hand whenever she can. “Sometimes you can’t always be out there doing things, but even just the financial and physical support is a huge help,” Rogers said. Rogers continues her love and passion for nature from home, often hiking through the woods or taking the time to appreciate her environment. “I notice nature, I notice the shape of trees, even when I drive on the highway. I came back from Moncton on the weekend, and I think I saw a total of 60 deer feeding along the roadside. I commune with nature just by being outdoors and seeing and smelling everything. I love the sound of the wind, the smell of fresh rain, snow, even the cold.” said Rogers. Rogers recommends that all nature lovers stay updated on issues that affect our environment.“Stay informed. Its understanding the public policy that really affects our environment. A lot of people don’t even put the two together: An ill-conceived forestry management plan, for example, will come back and haunt us,” said Rogers. Thank you Ruth for your ongoing support to Nature NB, and for being a great person that this organization can truly rely on. 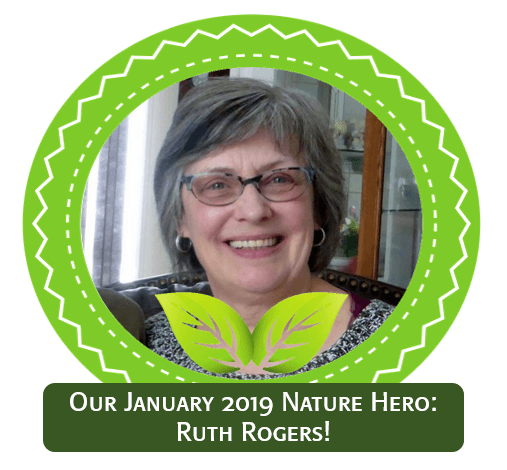 Ruth Rogers, you are our Nature Hero of the Month!